Product prices and availability are accurate as of 2019-04-18 12:24:04 EDT and are subject to change. Any price and availability information displayed on http://www.amazon.com/ at the time of purchase will apply to the purchase of this product. Get ready for the grillout of the year with the Smoke Hollow BTU Gas/Charcoal Smoker Grill! 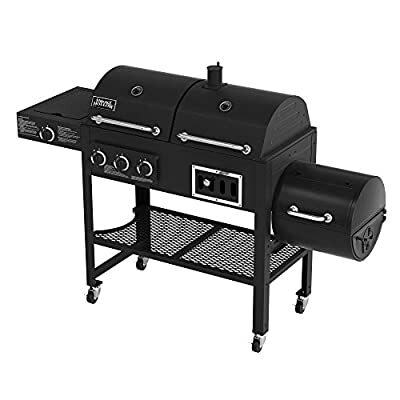 Choose between charcoal or liquid propane grilling to create your barbecue masterpieces, smoke your meat in the side smoker, and sear it on the 10,000 BTU side burner. This is one versatile grill! Overall, this grill offers 860 square inches of cooking surface. That's a whole lot of deliciousness! 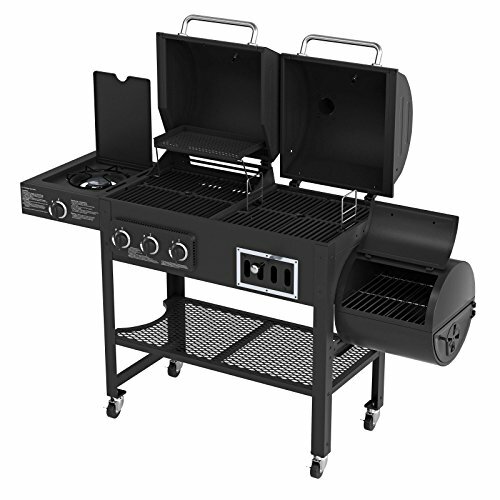 The grill moves easily on four locking casters, making it a breeze to relocate your grill-station. Both of the grills, charcoal and gas, feature porcelain-coated cast iron cooking grids. The gas grill also includes a porcelain-coated flare guard, a porcelain-coated warming rack, and a removable grease tray and cup. The charcoal grill also includes an adjustable charcoal pan with grate and deluxe sliding air damper control. Both grills feature a temperature gauge. Don't forget the side smoker and 10,000 BTU side burner, either! This versatile grill has everything you need to become a grillmaster extraordinaire. About Outdoor Leisure Products, Inc Based out of Neosho, Missouri, this American company is dedicated to designing, manufacturing, and marketing products of superior quality at an affordable price. Their smokers, wagons, and accessories are sure to infuse your brisket, chicken, rack of ribs or any other dish with a flavor like no other. And it's all thanks to Outdoor Leisure Products Inc's attention to detail. So whether you're a retailer or a customer looking for a great backyard barbeque, the name Outdoor Leisure Products is one you can depend on. Gas and charcoal grill with side smoker. 860 square inches of cooking area. Burns charcoal and liquid propane. Three 10,000 BTU stainless steel tube burners. 10,000 BTU side burner. Dimensions: 66W x 22.5D x 45H inches.